RTÉ 2FM and MCD have come together again to host the biggest Xmas Ball yet in aid of ISPCC. Picture This will headline on the night along with the RTÉ Concert Orchestra and many more to be announced. The 2FM Xmas Ball will be hosted by various 2FM presenters. 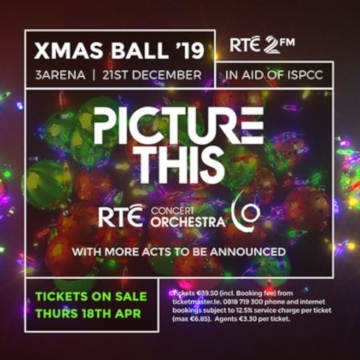 "The ISPCC is extremely grateful to 2FM, the RTÉ Concert Orchestra, 3Arena and in particular Picture This and the other artists who will be taking part in the Xmas ball to raise over half a million euro to provide support for vulnerable children in Ireland who need our services. We Will Never Give Up On A Child. Ever. The ISPCC is Ireland’s national child protection charity. Its mission is to make the protection of children everyone’s priority. The ISPCC provides a range of services directly to children and families and advocates for change to enhance the lives of children in Ireland. The core aim of all of the ISPCC’s services is to build psychological resilience among young people. The ISPCC also depends on the commitment of its volunteers who give their time to listen to, and mentor, children across Ireland, and provide an invaluable support to a generation of children. In 2018, these volunteers provided almost 45,000 hours of service to children. Without these incredible people, who give their time voluntarily, the ISPCC could not maintain the level of services it provides.